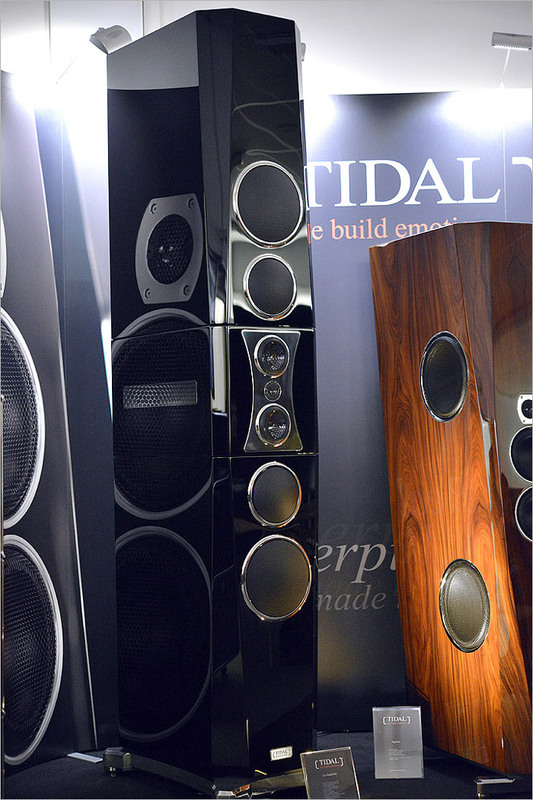 "Master speaker builder Jörn Janczak of TIDAL loudspeakers was among the first persons I had met when I came first came to Munich back in 2003 (the last show held in Franfurt before moving to Munich in 2004). Since that time Janczak has literally turned this show on its proverbial ear. Whether showing off his newest series of electronics or those magnificently finished loudspeakers (top photo), he's always got a trick up his sleeves that leaves me stuck in deep admiration. Debuting at this year's show was Janczak's most auspicious project to date: the nearly 8' ft tall La Assoluta. Sporting two of the world's only Accuton diamond midrange drivers, Janczak seemed quite proud of this latest design. "Take the Assoluta, for example. 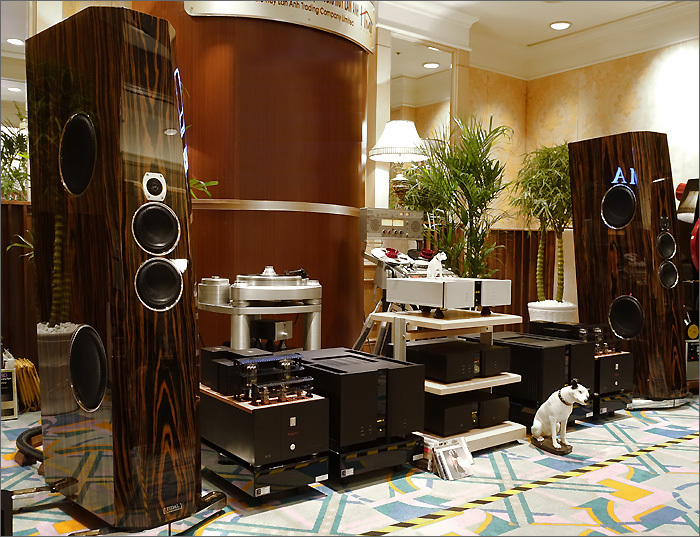 This loudspeaker is (current) the pinnacle of his art, and it looks it. 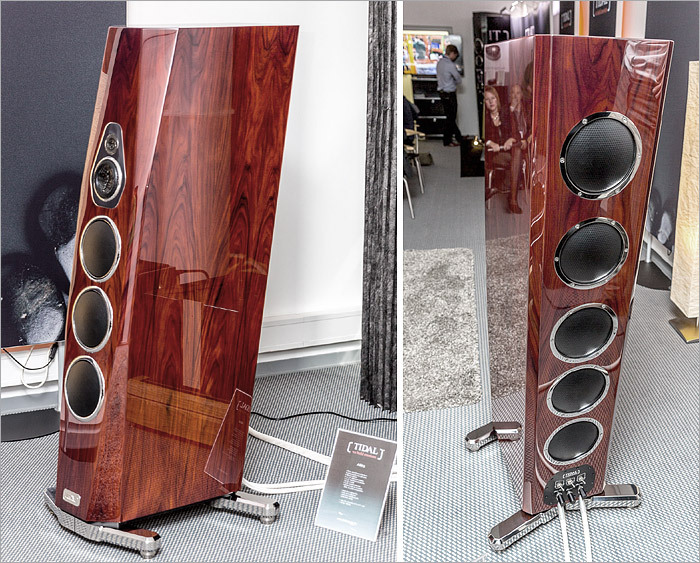 It’s also priced like it, but while €500k is nowhere near the most expensive loudspeaker available at High End, it was one of two where the attention to detail that caught my eye reached a level that made my brain start sweating. Oh, my, that TIDAL finish is simply out-of-this-world. I really have never seen anything like it. “TIDAL piano black” is to “piano black” as a black hole is to empty space. I could feel it sucking at my soul as soon as I stepped into the room. "Since its born the German brand was focused on building complex and big loudspeakers and the elegant Akira confirmed the TIDAL tradition. 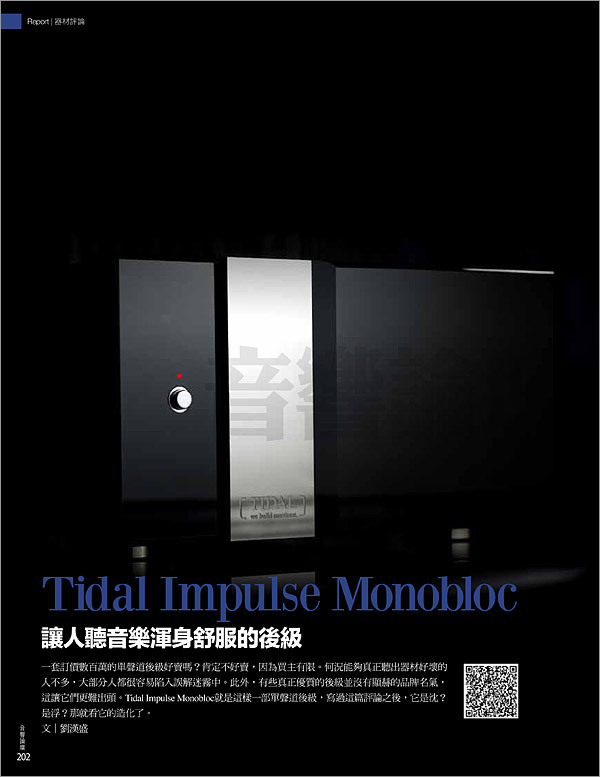 What that really hit us was TIDAL amplification with Presencio LS preamplifier, Camira DAC and Assoluta Monobloc. The sound of this system leaved nothing to the fantasy, all was present in front of our eyes: not voices but singers, not sounds but instruments." 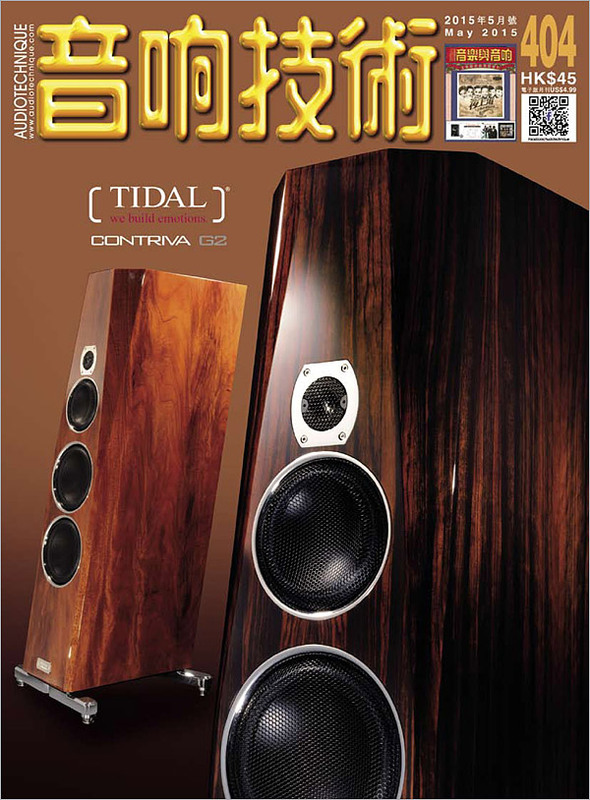 Not only receiving a great review and being praised as a wonderful product, also the TIDAL Contriva G2 is the new reference private speaker of the editor in chief from AUDIOTECHNIQUE magazine. 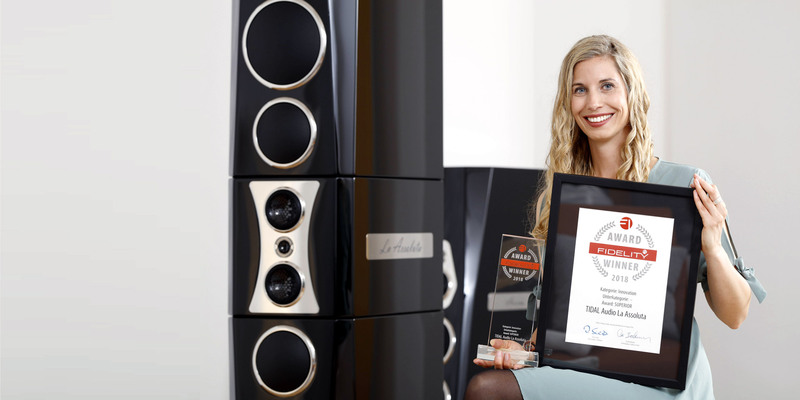 TIDAL Agoria “Product of the year award 2015” from HiFi Review. "....With various recordings one can hear constanty an amazing level of neutrality of its own class and an excellent soundstage. Neutral means natural and without any effects. It is fast, but not rushed, it offers excellent control, a strong 'push', but not being rough. It sounds very relaxed, open, sweet, when needed very shiny, when needed very large and has a very clear sense of the sound field itself. The Impulse Monobloc has a ifelike resolution and enough power to sound realistic anytime and it does not tire the ear at all. 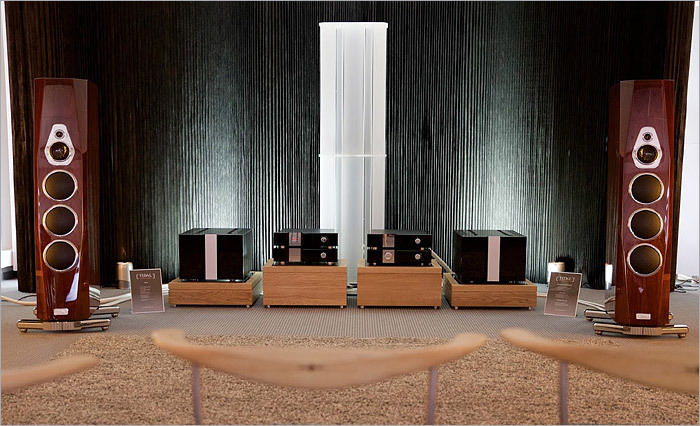 If I can say a conclusion after amazing hearing sessions, then it is: one can listen to any kind of music on the highest comfortable level in excellent quality without any kind of harshness." "... 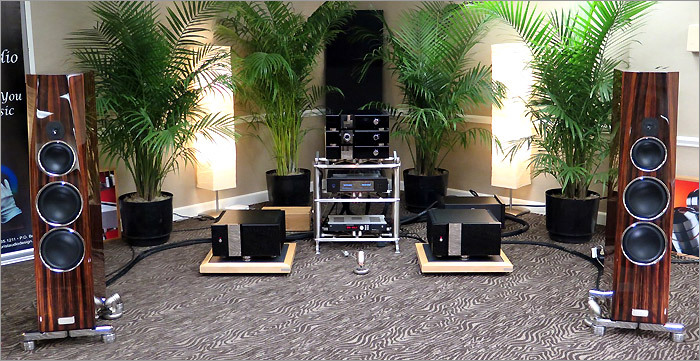 I have to say, first of all, that the TIDAL equipment was radically beautiful to see, and a smokin' knockout to hear! What workmanship in both domains…a real reference standard for how things should be. Sonically, the sheer scale and dynamics of the music in this room was bloody extraordinary. The electronics might have been new to North America, but the effect was "Audio Oasis! Award material" all the way. The sound was effortless, fluid, natural, organic, and had the sort of transparency that I associate with only the finest sort of designs that I've encountered on this planet. Detail without edginess; dynamics without loss of control; full-frequency-range presentation without humps or valleys." "The system generated an gigantic soundfield. Unlike some systems, the soundstage was not artificially elevated, but nevertheless retained pinpoint imaging and sweet high frequencies. Bass was fast and taunt, avoiding both bloating and muddying up the lower midrange, resulting in superb clarity. Stravinsky’s Firebird Suite was awe inspiring, scaling well with no sense of strain. Though over-orchestrated, Nat King Cole’s When I Fall in Love demonstrated life-like male vocals with no hint of sibilance." 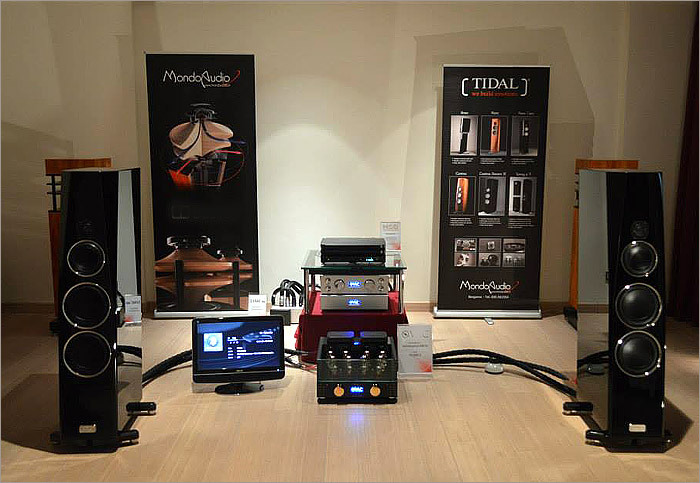 The TIDAL Contriva G2 was exhibited at the Highend audio show in ROME. Lot's of visitors voted it for the best sound of show. 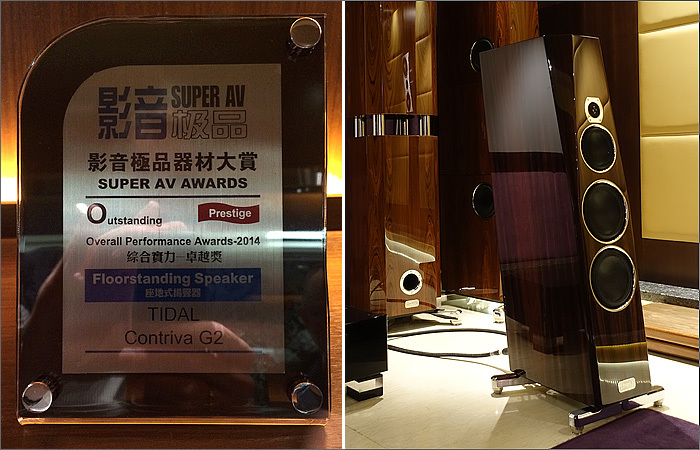 TIDAL Contriva G2 is being rewarded in HONG KONG for its outstanding performance. TIDAL Agoria with Audionote/Kondo Kagura.